Feel free to wear your favorite steampunk styles all year round with the simple addition of one of these fabulous womens steampunk jackets or Neo-Victorian coats. We offer a fine selection of womens steampunk outerwear in a range of styles to help you stay warm and fashionable in any kind of weather. We carry a number of leather steampunk jackets, womens Neo-Victorian frock coats, formal steampunk blazers, and lacy period shoulder capes. Whether you prefer to dress as a fine Victorian lady, steampunk pirate captain, or in modernized steampunk style, we are sure to have something you will enjoy. These jackets are available in a number of sizes to help you find one with a great fit. Decorated with details like buttons, faux fur, ruffles, floral lace, D-rings, and metal gears, our womens steampunk jackets and period capelets offer incredible style to your steampunk cosplay. When heading out for an evenings entertainment, make sure to guard against the chill in the air by taking along your Amy Bolero Shrug. 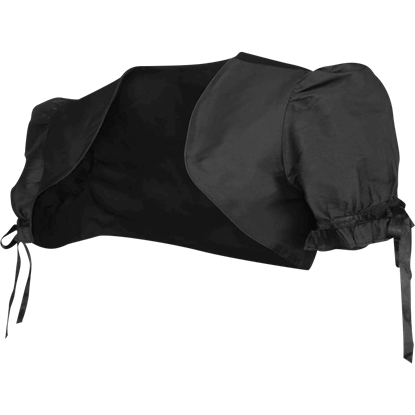 This elegant shoulder cape will go well with a wide range of sophisticated formal apparel. An excellent ladies shawl for all types of formal occasions, the Amy Lace Bolero Shrug covers your shoulders and upper back with sheer floral lace. The elegant lace shrug features a subtly ruffled hem along the edges. This beautiful ladies jacket will give you a commanding look as you stand on the deck of your ocean-faring vessel. 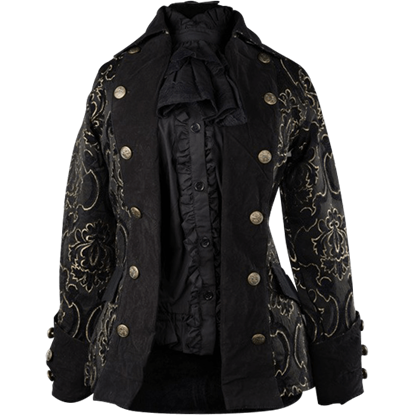 The Black Jacquard Lady Pirate Jacket displays an ornate vintage pattern perfect for formal occasions. This long jacket brings incredible steampunk fashion to any ensemble with its unique look. The Black Steampunk Openbust Tailcoat is a licensed design from Steampunk Couture and renowned steampunk model and fashion designer, Kato. Sometimes a lady needs an extra layer to her outfit, whether to pique interest or lend coverage. The Black Taffeta Bolero does just that! 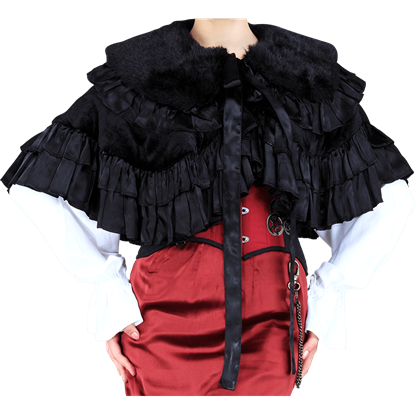 This short puff sleeve jacket fits right into Victorian, steampunk and romantic gothic fashions. Vintage fashion makes a comeback in the unique designs of steampunk clothing, like this long Neo-Victorian jacket. The Brown Steampunk Elegant Aristocrat Coat manages to be elegant and practical, showing off a rich brown hue. This long jacket brings incredible steampunk fashion to any ensemble with its unique look. 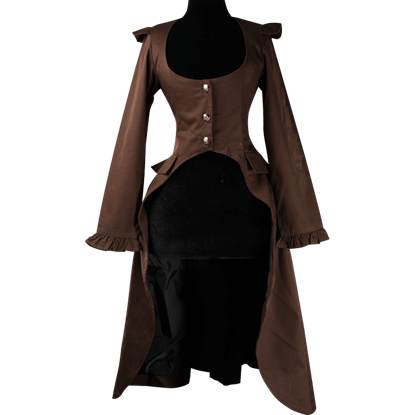 The Brown Steampunk Openbust Tailcoat is a licensed design from Steampunk Couture and renowned steampunk model and fashion designer, Kato. The Brown Winchester Corset Coat makes a stunning addition to the ensemble of any industrious lady from the Victorian era. This cotton brocade jacket features a buckled waistlet that laces in the back to provide an hourglass figure. The accessories and small touches are what makes an outfit great. For example, adding this Countess Multi-Layered Shrug is a great way to accent any Victorian or neo-Victorian outfit while maintaining the look of aristocracy. Whenever you head to the opera, a cocktail party, or other fancy dress event, make sure you have the perfect ladies outerwear to protect you from the elements. The Dark Lady Gold Brocade Coat provides a stunning touch to your look. Perfect for anyone who enjoys vintage fashions, the Dita Cream Lace Bolero Shrug makes a charming ladies wrap for chilly evenings. The short lace jacket is crafted from sheer, ruffled lace that displays an elegant floral pattern.